Juan Martin Del Potro advanced to the quarterfinals of the Delray Beach Tennis International Championships Thursday night with a 6-1, 6-1 victory over Teymuraz Gabashvili. After the match Del Potro commented that he “had a good night” adding that he is “getting better match by match” and that he “played better than [his opening match on] Tuesday”. 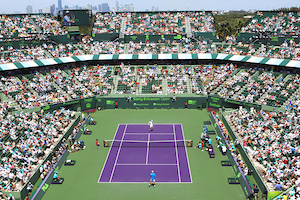 Q : Do the matches that you have won last week in Memphis and here in Delray give you confidence heading into Indian Wells and Miami? Del Potro : Yes, I need to get more confidence and rhythm in matches. [I need] to get on the courts and feel the sensations of playing a match – nerves, being in a stadium with crowds – it is something that I lost while being out for a year. I need to recover [these experiences] as they are what lets one win matches. Del Potro will face fifth-seeded Kevin Anderson in the quarterfinals on Friday. 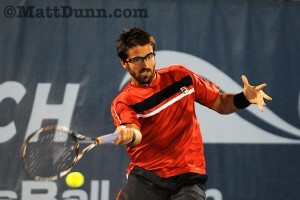 Anderson advanced in straight sets by defeating Florent Serra 6-1, 6-4 in the final match of the night session. In the afternoon session second-seeded Mardy Fish advanced in straight sets over Ricardo Mello 6-2, 6-1. 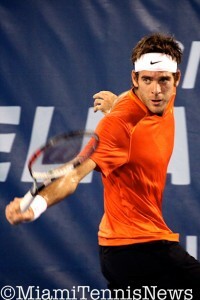 Fish is attempting to return to the Delray final after winning the title in 2009. In another second round match, qualifier Alejandro Falla advanced in straight sets over Adrian Mannarino 6-3, 6-2. Falla faces Fish in the first match of Friday’s night session. 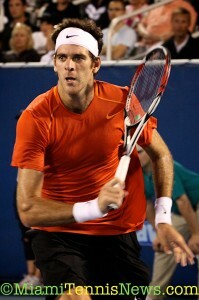 The first quarterfinal match of Friday features qualifier Ryan Sweeting taking on 2008 Delray champion Kei Nishikori. Ivan Dodig faces sixth-seeded Janko Tipsarevic in the second quarterfinal match.